Earlier this week we reflected on how the world sees Christians as Just. Plain. Crazy. A few years back, Brad Paisley wrote a song about exactly that. It’s an interesting take on what we may look like to those outside the faith, will all our faith and flaws bundled together. Hope you enjoy this video put to his music by the United Church of Ovid. Peace! When you throw a party, how early do you send out invitations? Nobody with a lick of sense creates a playlist, orders a cake, sets out coasters, fills a cooler with ice and then just hopes people will show up. We send out invitations weeks or sometimes months in advance so the people who are important to us can plan to be there. We lay the groundwork. My brother John Schultz recorded a cover of “The Cross” by Prince. I love this version and hope you do too. Mission trips are enriching and humbling experiences. I was 40 years old when I participated in my first one. We went to Lake Charles, Louisiana to help rebuild homes and lives after Hurricane Rita tore through the city. Our leader and trip coordinator was a retired pastor I greatly admired. He had decades of mission experience, and shared wisdom and advice with us in preparation for the trip. One of the the things he told us was that people would be grateful for our help and would offer us food and drinks. He explained there might be a temptation to say no if we thought the person was being generous beyond their means out of sense of obligation. It was not our job to make that decision for them. We might be offered food we didn’t recognize or think we’d like. Barring food allergies or ethical restrictions, we were advised to accept and eat at least a small portion. When someone offered us hospitality, we were to accept it because refusing it would display a lack of respect to the soul and person. The pastor’s advice to drop my paternalistic, privileged attitude (my words, not his) has stuck with me all these years. He taught me to say “yes” was to say grace. Recently I realized there was even more depth to this lesson. The people we served had no idea what kind of people we were when we weren’t roofing, repairing fences, or clearing debris. They didn’t see our petty squabbles about church policy, estranged families, drunken self-pity, and criminal records. We were each invited to their table because, at least for that moment, we had all gathered in the name of Christ. And that’s all they needed to know. We can have a lot of trouble extending the same grace to people we know well. If you knew all my bad behaviors – or thought you did – you might not think I should be accepting communion. You really might think I shouldn’t be offering it. But in that moment, whether we are giving or receiving, we are gathered because of Christ. In that moment, we are what Christ hopes we can be all the time. All the other moments of our lives may range from imperfect to downright wicked, but at Christ’s table we gather for a single, pure purpose. 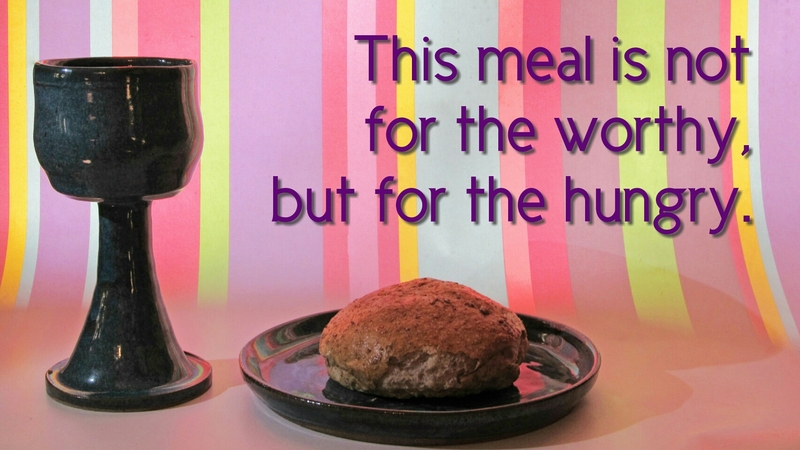 Grace allows us to accept the Bread of Life. Grace allows us to offer the Cup of Salvation. When Christ invites us, we are to say “yes.” And that’s all we need to know. As we enter Lent and think about renewing our hearts and spirits, we can be open to inspiration from all kinds of sources. Mumford & Sons decline to identify their work as specifically Christian, but this song about grappling with our faults is inspiring. Now there’s a concept that’s become twisted over the centuries. A couple years ago I attended a class that was supposed to be on workplace etiquette, but turned out to be mostly about table manners: what to do with your napkin and your elbows and your bread plate and all that jazz. The presenter insisted breaches of etiquette could seriously limit your career. This view of etiquette as a set of arcane rules the elite use to distinguish the worthy from the unworthy warps the true purpose of etiquette, which is kindness. The classic etiquette dilemma when presented with a very formal table is: “Which fork do I use?” The implication is that using the wrong fork would signal your lack of class. Do you know why the general rule is “start from the outside in?” A good host sets a place with only the utensils that will be needed, in the order they will be needed. This way, a guest does not need to understand the difference between a fish fork and a fruit fork. The formal setting was designed to minimize the embarrassment of guests, not to create it. My mother-in-law had a rule of thumb about decorating: no matter how good it might look, never put anything where someone may accidentally break it, because you don’t want to set anyone up for embarrassment. As far as I know, you won’t find that in a book on manners, but it is an excellent example of etiquette. Etiquette should always be about making someone feel comfortable and welcome, not about belittling them. What is the proper etiquette for a faith community? In many instances, it has been as warped at the communion table as at the dinner table. We develop rules about language, behavior, and belief that may seem completely arbitrary to an outsider (and frankly to many insiders as well): what to wear, how to pray, where to sit, when to stand. When we set up insider rules then judge people for not following them, we are not being at all Christ-like. Sadly, we are too often more concerned with calling someone out for using the wrong fork or hymnal than with creating an environment that helps people learn and grow in ways that foster harmony. In a faith community and all other matters, etiquette is not about looking outside ourselves for reasons to be offended, but about looking inside to ask if we are genuinely caring about others. Jesus wasn’t concerned with arbitrary rules imposed by polite society, but he was interested in creating a just society where all were valued. At the last supper he didn’t worry whose elbows were on the table; he was preparing for the ultimate sacrifice to make sure everyone was welcome to the feast.